All this week, I’ve been attempting to tempt you with delicious recipes for delectable Mexican food. Now, as promised, here’s one way to wrap it all up together. I speak, of course, of the humble taco. 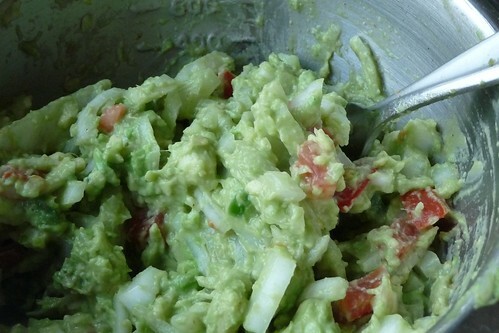 While both of the recipes previously work wonderfully on their own and can be used with many varied meals, they go nicely together and fantastically well if you tie them together with a bit of guacamole. Combine all ingredients in a small bowl and mash together thoroughly. I strongly encourage you to make these three recipes, pick up some soft wheat tortillas and have a taco night. It’s worth it, trust me. Tacos are one of the great foods that really don’t need a recipe. But, for my sake (and yours too), here’s a “recipe” that links to all of the recipes used for the component parts. Spread a bit of each on a tortilla, fold in half and enjoy! This entry was posted in mexican, recipes, sauce, side, snack, untranslated, vegetarian. Bookmark the permalink.